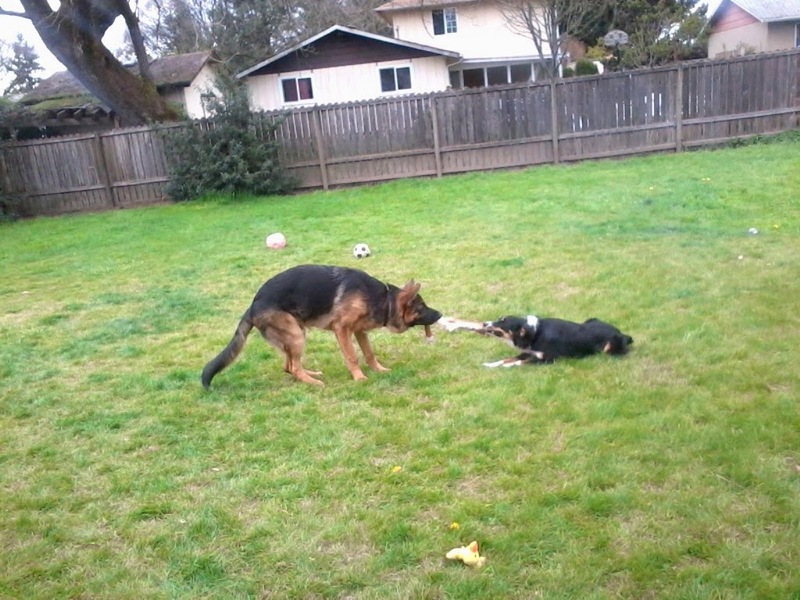 Dog training for the Newberg, McMinnville,& Sherwood Oregon areas. The power of Positive. Puppies!!! Everyone loves puppies!!!! Right? The minute you see one, your heart melts and you start daydreaming of what it would be like to have one...until you remember the house breaking, the chewing, the biting, the training, the list goes on and on. However if for some reason you don't remember all of those things, or you have never had a puppy of your own before...remember one thing, they are worth it, and you can get through this. At first you are like, "how can this cute little ball of fur be any trouble?" Right? Well enough of the problems we and our new found best friends have, if you don't know them you soon will. How do you fix the problems, or even better, (if you are smart and are researching all this before you bring home that new bundle of joy) how do you prevent such issues from occurring in the first place? Second. Pick up a clicker before you leave that pet store. If you want things to go as smoothly as possible with your new adopted family member, you need to make sure the communication between you two is as solid as it can be. A clicker is there to help reduce miscommunications. Sounds great right. It is. Lets say you are working on potty training, you take your pup outside, she potties on the grass (or wherever you want her to), you click the clicker as soon as she is finished, then she gets a treat (you know the ones that will motivate her). The click is telling her what she is getting the treat for. It's faster, and more accurate than a word is, and it also bypasses the frontal cortex of the brain to go straight to the amygdala to be processed. In other words it just works better, and the information is retained longer. I also highly recommend using a crate or playpen to house your pup when you are not going to keep a direct eye on her. Keeping a food and water schedule is also a great way of preventing those slippery accidents on the floor. Put water out once an hour, then take her out to potty. Offer food two or three times a day, then put it up out of reach. You will soon learn how long your pup can go between meals and drinks. I know you really want to get that puppy as soon as possible, but let me tell you, you will be much happier in the long run, if you wait to get your pup till after it is at least 8 weeks old. The longer they get to stay with their mom and other litter mates, the more they learn through them, and the less they have to try on you. You don't speak dog as well as their mom does, so trust me, somethings mom is better off teaching. Bite inhibition is one of those critical things that they learn from playing with their litter mates. If they bite a litter mate too hard they get a squeal and the fun ends temporarily. So they learn not to bite as hard, their little milk teeth are just as painful to each other as they are to you and I. Let them learn on each other and not you,or your children. If you do get a pup who is hell bent on seeing just how hard he can bite you, squeal just like his litter mates would have, stand up, end the fun by placing the pup in a crate for a minute or leaving the room. Another thing to do is have a tug toy near by, if your puppy starts to try and bite your hand (as cute as it may be, don't allow it) offer the tug toy instead. Show your pup that toys are for chewing and playing, not human body parts. If ankle biting becomes an issue, play freeze tag with your dog and click when he does not go for the feet, or hands. It helps if you be "a tree" as shown here. I also ask for a sit as soon as I stop, then click and treat for the sit. Walking.....Do Not allow your puppy to pull on a walk when you first get him! The only reason a dog pulls is because he has learned that it gets him where he wants. The leash is something all dogs have to learn, and the sooner they learn it the better off everyone is. Start when they are small. If you have a large breed, trust me, in a couple of months they will be bigger than you think. Not that I have anything against having your dog off leash, it's just that they will need to be on leash at some point in their lives, and more likely than not, that will be most of the time they are out in public. You don't have to drag your little friend all over the floor to teach him to walk with you either. Nor will you need to resort to pinch collars to keep your pup from dragging you down the block. To teach your pup that walking next to you on the leash, I use a treat on a spoon that I can hold down and then pick back up out of their reach. So when I click I hold the spoon down, let him take a lick or two, them walk a few steps, and if your pup stays with you click and let him have a lick. You can use big wooden or plastic spoons, or these little baby food spoons. Once your pup seems to have the right idea you can try to put more steps in between each click. You will be the marvel of all your friends who have dogs when they see how well yours is walking on leash. Puppies keep those sharp daggers till they are about four months old, then they fall out and they grow new ones. At that time they start to chew on whatever feels good on their gums. If I were you, I would invest in several different dog toys that are different textures to see what it is your puppy likes. They will teeth on and off till they are about 11 months old. They start growing in molars after they replace their milk teeth. Don't chase your puppy if he runs off with your favorite shoe, skirt, or toy, etc. Puppies LOVE the game chase, once they learn how to get you to play with them, they will use it as often as they can get away with using it. It's better to teach your puppy the cue for "drop it" and Leave it" then calmly walk up and retrieve the item. You can use this chase game to your advantage though, if your pup escapes the house or yard and will not come back. Run in the opposite direction calling your puppy's name, he will think you are playing chase, and most often will follow you. Ever wonder why, when you click that little button on a clicker, your dog lights up like it's Christmas time? Lets put it this way, why do you like facebook? How easy is it to write your woes as a facebook status versus telling them personally to all your friends or acquaintances. The lack of emotional response can be quite freeing. That's why it's so easy to say the wrong thing or take things the wrong way. Lack of ability to convey emotion. Now what if you were only able to get positive feedback and happy, good feelings from everything you saw and read on Facebook? The fact that your computer screen can not give you any real emotional feedback makes it a perfect way to show how your dog sees the clicker. The clicker is just like your computer screen, only you can give it any ties to emotion. When you pair the clicker with yummy treats and good times from you, you suddenly have that magic happy feeling button. It never means scary, or bad or grumpy growls. If you use it often enough your dog will begin to see you in more of the same way. If you use it (paired with yummy treats, or a fun toy) around places or things they find scary, your dog will quickly learn to associate more happy, positive feelings with those that were once scary. Pretty simple. Yet very powerful. Doing what you asked, when you asked it. All thanks to the power of that little clicker in a box. At this time of the year we are busy setting new goals for ourselves, have you stopped to think about setting some for your 4 legged companion? It's really very similar to teach them to stop doing that really annoying thing, such as jumping all over you nice work suit as you get ready to walk out that door. So how do you do it? Well I just finished reading an article on how to succeed in your own personal goals and I was surprised at how much is exactly the same for dogs as it is people (in fact I had to double check I wasn't reading about dog training). First off everything we do has a cue. All our habits can be trace back to some sort of a trigger. The same is true of your dog. Why is it you are always craving that dessert after dinner? Is it because that was what your family always did, so you do it too? Why do we eat comfort food when we are upset? Because it triggers good feelings and memories. It literally makes us feel better. Your dogs are no different. What triggers your dog to jump on you? Watch closely, notice the patterns that set life up. A lot of times you dog knows when they hear the sound of your car, it makes it's own unique sound on the road. When they hear that they get excited. When a dog is happy to see someone instinct tells them to lick the lips or mouth of the one they are happy to see, just like we give someone we love a hug. The only problem is that our mouths are so far away. So they jump. When you are getting ready to leave you probably go through a routine, you dog notices that, and so starts to go through their own. If your dog is feeling lonely or bored and wants to play, but you are glued to the t.v. set, what's a dog to do? Well they always get you up on your feet when they pick up an item that is either forbidden (your understanding, not theirs ), or if they pick up some new, novel thing. Then they get you to play that beloved game of chase. Even if it ends with them getting into trouble, they think it's worth it. This is where you get to choose new cues, what they are to mean, and when they will be implemented. Lets take the issue of chewing on things he shouldn't. You will need to teach the "drop it" cue and the "leave it" cue. Then work on the "come" and the "fetch." Here's how it would go. Take a tug toy and start playing. Grab a yummy smelling treat and hold it right up to his nose. He will drop the toy to open his mouth in order to eat the treat. Right there is where you would click and then let him have the treat. The click tells him what he just did is correct, and that is what he is getting the treat for. Then you repeat. Play tug, say "drop it" while holding the treat up to his nose, then click and treat as soon as he drops the toy. Next work on the "leave it" cue. Hold a treat in your hand and tell your dog to leave it. He will most likely try to get it. It is most important that he does not. Close your hand around the treat and if you need to pull it in close to you (not above you which will induce jumping). As soon as he settles back down away from the treat, click and he can have it. Slowly try to get the treat down between his paws, this might take some time. Don't go any faster than he can resist. You want to set him up to succeed, not fail or he will get frustrated and not like to play this game anymore. So now you have your dog dropping things and leaving them where they were dropped for you to come retrieve. Now call your dog to you for a nice pet, or a treat. That will then reinforce the come. Now to teach your dog to play fetch, so that when you are tired, your dog can still play with you without getting into trouble. See how we are replacing the triggered behavior? Here is a short clip of how to teach your dog to play fetch. Note that your dog will take a bit more time, as Roxy knows how to fetch, she is simply being taught to fetch an item she does not normally fetch. The teaching method is the same though. So remember if your dog is needing some help with his New Years goals this year, you now have the know how to help him. Don't just try to stop bad behavior, replace it with something you want your dog to do instead! Here's to a Happy New Year! "If we can teach Killer Whales to pee in a cup, you can teach your dog without punishment." What I use and recommend!